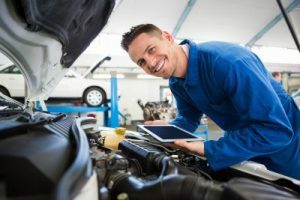 At Art Morse Auto Repair, we believe that routine auto maintenance is the best way to avoid rapid depreciation and disrepair of your vehicle. Bringing your car into a shop in regular intervals guarantees that you will catch problems before they develop into costly overhauls. What does our basic automotive maintenance involve? Responsible car owners know that the oil and filter should be changed every 3,000 to 8,000 miles depending on what type you use. We are happy to perform oil changes as part of your routine maintenance schedule. In addition, we include a full inspection of the transmission fluid levels, coolant, power steering fluid, tire wear, and exterior lights. Did you know that keeping the interior clean can increase the value of your car when you're ready to sell or trade it in? Our mechanics are no strangers to cleaning — we vacuum your vehicle’s floor mats and carpet as a courtesy during each routine service. To ensure good fuel economy, manufacturers recommend changing your car’s air filter every 15,000 to 30,000 miles. At this point, we also recommend a battery and coolant inspection. Sudden failure of either of these critical components can mean the difference between being stranded with a dead car and arriving at your destination on time. Our mechanics will perform a free diagnostic code scan to determine what is triggering your vehicle’s check engine light. A diagnostic trouble code is caused by one of usually five categories of engine component malfunction. We use extensive databases to identify what the code means for your specific make and model and then take preliminary steps with you to decide whether you’re ready to repair or replace the part. Contact our shop for preventative maintenance that increases the life of your car.